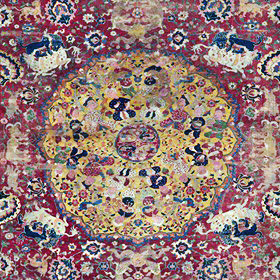 This exhibition features six small Iranian carpets of the 16th and 17th centuries that have recently been conserved by the Department of Textile Conservation thanks to the proceeds from the Museum’s annual celebration of the Persian New Year, the NoRuz at The Met Gala (2013). The carpets include two lively 16th-century animal combat examples, one with a group of merrymakers seated around a duck pond. Another is a prayer rug of the distinctive “Salting” type, named after the Britishcollector who first acquired these rugs. The three 17th-century carpets from the period of Shah Abbas the Great (1587–1629) are made of silk and precious metal thread. Opulent weavings of this type decorated palaces in Isfahan, to the amazement of European visitors. The labels and text panels in this exhibition focus on the conservation of the carpets as well as their place in the history and art history of Safavid Iran.